August can be a brutal month. The relentless sun beats down, forcing our retreat to air-conditioned spaces. Cicadas whir their summer song and, but for cool spots high in the Rockies and sprinkled elsewhere across the land, the U.S. is blistering from Maine to California. The last thing in the world you want to eat, much less prepare, is something hot. One possible antidote to all this heat is grilling: It keeps your kitchen cool. Another solution, however, is to eat cool and delicious dishes, preferably those that do not require much in the way of cooking, period. Fortunately, the very season that brings on all this heat is also responsible for providing us with an abundant supply of fruits and vegetables that can be prepared, often with little or no cooking, to satisfy the summertime craving for something light and cool. The first of these cool summer salads, Company Chicken Salad, does call for cooked chicken breasts, but that is the total extent of the "cooking" required in these four salads. Combine diced chicken, celery, lemon juice, minced onion and salt. Stir well, cover and refrigerate. Just before serving, add the mayonnaise, chilled grapes and mandarin orange sections, and slivered almonds to the chicken mixture. Mix well. Makes about 6 servings. The next dish, Sliced Tomato and Onion Salad, is a simple and delicious accompaniment to any meal. Not only is it easy, but it packs a lot of nutrition and taste into relatively few calories. Combine first 6 ingredients in a jar; cover tightly and shake vigorously. Set aside. Core tomatoes; cut each into 6 slices. Thinly slice onion and separate into rings. Layer tomato and onion in a shallow dish; sprinkle with oregano. Pour vinegar mixture over vegetables; cover and marinate in refrigerator 3 hours. Yield: 12 servings (about 22 calories per serving). And don't let this summer go by without taking advantage of the plump and ripened melons that are crowding the shelves and bins of the supermarkets. 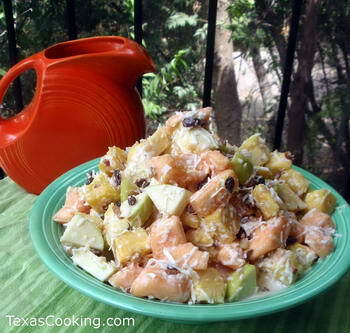 There are two salad recipes, Melon Mlange and Cantaloupe Fruit Salad, that do this beautifully (and beautifully is a particularly good adjective to use in this case, since these fruit salads are a visual treat). This salad looks pretty, even if you don't use a melon baller. For a buffet or crowd, you can double the recipe and serve it up in a hollowed-out watermelon half. Combine lemonade and orange juice concentrate with Triple Sec, and mix well. In a large bowl, gently stir together all the fruit. Pour the juice mixture over the fruit, and carefully stir. Cover and refrigerate several hours before serving. Makes about 8 servings. Mix yogurt and orange peel. Mix all fruits and nuts in a large salad bowl. Serve by coating individual salad bowls with yogurt mixture, then pass the fruit salad. There's no doubt that the dog days of summer are oppressive and uncomfortable. We owe it to ourselves and the people for whom we cook to lower the temperatures in whatever way we can. One way, of course, is a large helping of Chocolate Chocolate Chip ice cream. And that definitely has its place. But these delicious, healthful and enticing summer salads deserve a place on the menu to help us survive the summer doldrums.